Toronto GirlGeek: the algorithms edition! I am really excited to be speaking at the next Toronto Girl Geek evening. 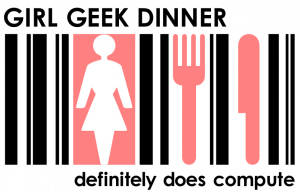 I remember attending one of the first Girl Geek dinners in London in 2005. It was organized by Sarah Blow, the founder of Girl Geeks. That evening was pretty much magical: I met Robert Scobble and Maryam Scobble. I also met Hugh MacLeod, Ben Metcalfe, Henriette Weber Andersen and a lot of awesome attendees whose names I can no longer recall unfortunately! It was a surprising evening, full of technology discussions, blogging, changing the world conversations and great wine – I vaguely remember a wine sponsorship there! Next week the Toronto Girl Geek evening is all about Algorithms. And that’s of course something I am super excited about! Not only am I speaking but TinEye will be hosting in our offices. I would suggest that you get a ticket, but I hear it is sold out! Can’t believe that there are that many people interested in hearing about algorithms! Inspire more women and girls into a career in science, engineering or technology by supporting Girl Geek Dinners. Perhaps your company could host the next one? Changing the ratio: we won’t stop until we change the ratio. Seriously. I know. It is a million times better to be starting and running a software company then talking about women in technology. Totally agreed! Speaking like someone who actually loves running her software firm! But… that said, it is hard not to point out where things can be improved in my community. And to be told to just shut up, well that’s a bit rude don’t you think? So what’s all the fuss about? Confoo which bills itself as bringing under one roof PHP Québec, Montréal-Python, Montreal.rb, Montreal Jug, W3Qc, OWASP Montréal, Android Montreal and local web developers. Confoo has 109 speakers in total. 5 of them are women. 5. It is not a typo. Earlier in the day they had 105 speakers. This is not the first year of the conference, nor the first time, the community has pointed out the lack of women: same ratio for 2011, and 2010. Because you know, pointing out an issue makes me a sexist, closed minded and disrespectful person. Oh yeah, now we are really talking about the issue at hand. My followers are thoroughly impressed. But perhaps not what was intended! It never hurts to restate the obvious. Well, if by IT feminist crusaders Ms. Anna Filina is referring to CEOs of software firms and founders, then I am guilty, and if by IT we are talking about the software industry, then guilty again! Darn you got me! But seriously: let’s grab a coffee and talk about how we can change the ratio. And no, it has nothing to do with the toys you play with when you are a child. There are so many awesome people working at changing the ratio (and running software firms) and all we need is first a dialog, then an action plan. Let’s talk. Let’s change. And let’s not call each other names. That’s just not NICE and the internet is so all kinds of nice. kthxbai! Sorry, got to get back to running a software firm. Chics in Tech. Girls in Tech. Ladies. Women. There can never be too many girls in tech, so join Tech Chics YYZ for an evening to connect with other female entrepreneurs like you. Tech Chics YYZ is a Toronto based network for emerging and established female entrepreneurs in mobile, web and software platforms. The first get together of Tech Chics YYZ is happening On Match 7th. Registration is open and this is a free event. The two hours event promises to be filled with “50,000 foot wisdom, perspective, proven expertise and tactical advice from those who’ve done it and are in the process of.” Geared towards high caliber tech founders, CTOs, investors and promising young start-ups, this event is intended to foster collaboration, mentoring and partnerships. But you wouldn’t know it by the looks of things in the technology, software and startup scene. Last night as I was catching up on some reading, got a tweet from David Crow about a new accelerator in Montreal Founder Fuel: I thought that’s bloody awesome. I wish there were so many accelerators a decade ago when I entered the software industry. Boy that would have been super helpful. And then I checked out their mentor list and BOOM! what the heck: an all male line up? in 2011? In Canada? In one of the most welcoming industries in the world (software) and from friends and colleagues I know. Oh no Founder Fuel you did not! This is getting very tiring. And needs fixing. 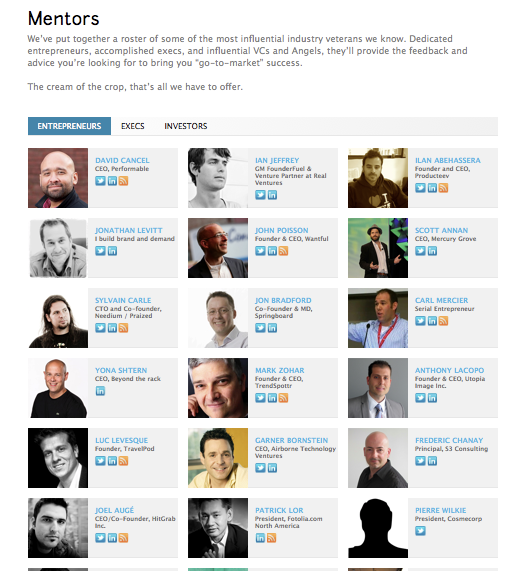 And then I browsed my way to the Grow Conference in Vancouver as I am planning a hacking event in Vancouver in August and to my surprise again: an all male line up for a start up, venture capital and growth conference in the tech space. Really? In 2011? Grow Conference: I love you. I attended your conference last year. But this: you need to fix. Now. I am a do-er. I am going to give you a solution that I can point to because you are too lazy to do some work. And I am tired of pointing this out every time. Yes, finding women you can include in your panels, mentorship programs, speakers line ups requires work. I am going to help you help my industry: I will be bringing you a We are Toronto Tech website very soon. NY is doing an awesome job at that with We are NY Tech and a spotlight in women in the industry as well. Take that Toronto. And we will be turning Toronto and Canada upside down to find you the women you need to include in your conferences and programs. In the meantime: you lot are connected to the world, get on your email and do some work please. I don’t want to hear a peep coming from you unless you are calling me to talk to me about the changes you have implemented. Now go. Ontario: 12 men. 0 women. Well… it is complicated but Sheryl Sandberg’s 3 comments are pretty much bang on!